Every week in the UK at least 12 apparently fit and healthy young people (aged 35 and under) die of undiagnosed heart conditions. 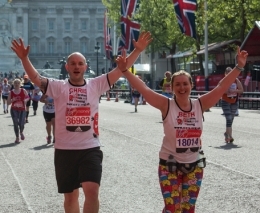 By running for CRY you will help us continue to achieve our aims and save young lives. WE PROVIDE SUPPORT BEFORE THE RACE, INCLUDING REGULAR UPDATES AND COMMUNICATIONS FROM CRUNCH OR DIRECT FROM THE CRY FUNDRAISING TEAM, A RUNNER'S PACK AND RUNNING VEST. WE ALSO OFFER AFTER-RACE REFRESHMENTS, MASSAGE AND SHOWER FACILITIES AT A CENTRAL LONDON HOTEL NEAR THE FINISH LINE.